Roulette is one of the most popular casino game online, and as a result, I have decided to write a blog about one of the most sought after roulette information, the roulette simulator. 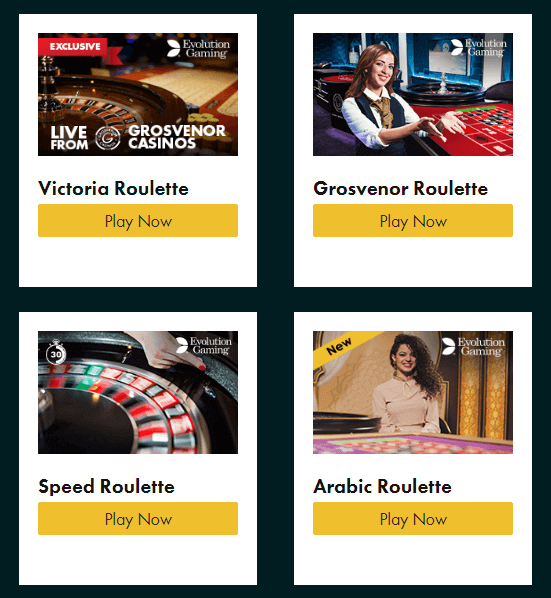 A roulette simulator is a combination of free online casino roulette games either for the purpose of testing various strategies or to have fun. In this blog, we’ve focused on the Walters sequence martingale roulette simulator, the custom progression-table free online roulette simulator, and the martingale roulette simulator. The Walters Sequence Martingale simulation mode is based on a fascinating strategy. For the novice players trying to understand it, I am going to keep it as simple as possible. It can only be used when you are placing Black or Red bets. The behavior when using this simulation mode should be transferrable to all the other simple chances. When you are placing your bets, you should ensure that they are between colors since the color that will be played will be dependent on the dominance ratios from the outgoing sequence. If the “equalization” checkbox is checked, then you shall be required to place a bet against the dominant color. Otherwise, you should place a bet on the dominant color. Several throws are usually divided into sequence blocks, and the sizes of the blocks are configured. The simulator then checks every block available and checks if each of the blocks is within the sequence an overweight of red or black. This will usually be expressed with the parameter “dominance ratio.” The dominance ratio is usually adjustable. If there is a particular dominance list within the sequence, then a bet is placed. If for example, there is 1 time green, 3 times black and 3 times red, or in case the dominance ratio is smaller than constituted, a bet will not be placed. Now, in case you have a dominance of your desired ratio, you should proceed and play the bet. The automatic play is playing on the equalization, but it can be adjusted. If you lose the bet, the simulator will behave like the normal Martingale System, i.e., your bet will be stacked double. The frequency with which the stake will be doubled in case a loss is incurred can be adjusted within the “progression steps” parameter. However, if the bet is won, a new sequence begins. At the end of a particular sequence block, a similar procedure like the one mentioned above is followed. This free roulette simulator enables you to place bets on non-linear, pre-defined progressions. To start using the custom progression-table free roulette simulator, you will have to set the mode in the simulator to “custom progression” and then select the “create progression table” option. Due to the complexity in the simulation mode, you will only be able to use a single field at the same time while playing. To begin with the custom progression table simulator, you will have to specify the number of rounds that you wish to play as well as the initial amount of stake you wish to bet. Once you click on the “Go” tab, the progression table will be created after which you can configure the steps of the progression. There will be two columns created: one to the left and the other to the right. In the right column, you will be required to configure the steps that the game will follow in the event you win the game and in the left column, you should include the bet amounts in the event that you lose the first step. Once you have created the progression table, click on the “Save progressions table tab and then click in the field that you would want the progression table to be applied. The value that you will have set in the progression table will automatically be set by the jet on value. To begin the simulation, click on the “Run Progression” tab to play through your set progression. 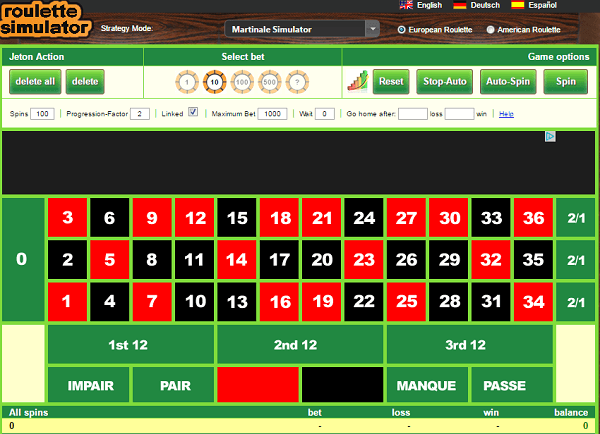 The last type of the free online roulette simulator is the Martingale Simulator. Unlike other simulators, the Martingale roulette simulator throws multiple spins at a go. In fact, with this simulator, you can throw up to 500 spins by a single click. Moreover, there is the “Auto-Throw” option, which allows for reputed throws after every three seconds. The stats and the balance are usually updated once you click on the “Reset Balance” tab. This simulator is normally configured in a number of options to enable the Martingale simulation to be as flexible as possible. In this, there are a number of options, which you can use to define the maximum amount that you wish to place a bet as well as set a flexible progression factor. This would be of great usefulness especially if trying to carry out a Martingale simulation that will be applied on Split and Straight Up bets. The martingale can be simulated not only for simple bets but also for all kinds of betting. Place a 1 jet on for all the numbers between 20 and 29. To have a better understanding of the Martingale Roulette Simulator, understand terminologies such as the throws, wait and go home after.